Sciences, Philosophie, Histoire – UMR 7219, laboratoire SPHERE - Apollonius de Perge, Coniques. Livres II et III. 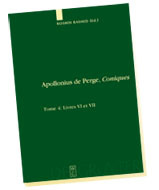 Accueil > Publications > Grandes éditions > Textes mathématiques > Apollonius de Perge, Coniques. Livres II et III. Texte grec et arabe etabli, traduit et commenté. The first three books of the Conica deals with the basic elements of the theory of conical sections, before Apollonius turns to particular problems in the following books. Until recently these three books were only known from Eutocius’ text. However, they were known to be part of an Arabic translation of a Greek version independent of Eutocius’ text. A close study of the Arabic texts of books 2 and 3 leads to the same conclusion as that which, as a result of the new edition, was reached for the first book : that the Greek version provides a better and sounder text. This volume provides a first critical edition of the Arabic text, the first translation of it into a modern language and a detailed historical and mathematical commentary.